SAN FRANCISCO: No matter who it is, whether teacher, professor, parent or boss, they always say the most important thing is the first impression. A good first impression can get you in the door. A bad first impression might ruin a relationship for its duration. 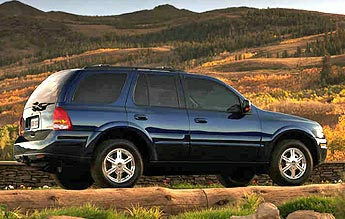 Our first impression of the redesigned for 2002 Oldsmobile Bravada was mixed to say the least. Its shape is not unlike its cousins, the Chevy TrailBlazer and GMC Envoy, but it is not as distinctive or striking as the other two. The Bravada is more rounded on the edges and is cleaner but its Olds derived nose and plain tail keep it out of the running for beauty queen. The front end treatment follows the current, and last, Olds styling theme that bears a familial resemblance to the Aurora, Intrigue and Alero. The new Olds logo at the center with the head and turn signal lights to either side with no traditional grill, just a lot of plastic covering the front bumper. Comfort for a vehicle in this class is an important attribute. The Bravada is comfortable, but you have to work for it. It took about three days before we found a really comfortable driving position, and the jury is still out on that one. We found the seats to be more bench than bucket in feel; we thought more than once that we were sitting "on" the seat rather than "in" it. In the rear folding the back seat down is a two-step process. First, you pull up on the tab at the rear of the bottom seat cushion then lift the lever on the side of the seat and pull it forward. This causes the headrest to fold back, resulting in a neat and tidy appearance and no storage issues for the headrests. Opening the rear liftgate is an easy affair as well. Lift up on the handle and it opens effortlessly, with the help of gas-filled struts. The glass opens separately with a push button just below the handle. The button will not work if the vehicle is locked, and there is no keyhole in or near the button, making it necessary to unlock the vehicle either from the inside or a hit to the key fob. The best rear seat feature is the combination audio and climate controls. When you hit the power button for the radio control back there, the rear speakers cut off for better listening with headphones. The unit gives freedom to the rear seat passengers to listen to what they want, as long as it isnt what the front seat passengers are listening to. For example, if the front seat wants to listen to a CD then the rear seat has to listen to the radio or vice versa. The rear seat climate control unit is like a "mini-me" version of the main controls. Fan speed, direction and temperature setting are chosen by pushbutton, an intuitive design that makes life a bit easier to cope with in the back seat. There are two cupholders and one power point in the center console geared toward rear seat occupants. Appointments in the rear seat are well thought out and make the rear as comfortable as the front, as long as no one sitting in front is over 6-feet-tall. The rear door openings are on the small side but seating space is more than adequate for mid-size adults. There is nothing brash or harsh in driving the Bravada. The transmission shifts smoothly and theres never any bad vibrations coming from the new engine. The only strange thing we encountered was a big-truck-like whine coming from the engine when the air conditioning was on full blast. The strange thing about this noise was that its pitch lowered as engine speed increased and then cut out after a few minutes. Since the air coming out was cold and this didnt adversely affect performance too much so we didnt think much else about it. For those that have an "active" lifestyle, Olds put an air pump in the rear cargo area. As well as serving as the pump for the load leveling rear suspension, it comes with attachments for blowing up inflatable rafts, sporting equipment and car tires, to name a few uses. We didnt get a chance to use this neat little feature but appreciated it being there. We averaged 16.3 miles per gallon with the Bravada, which isnt very good for this class, considering that full-size Utes are comparable in this department and the new engine has been touted as a gas-sipper. Our onyx black Bravada had no options, which means our as-tested price of $34,767.00, including $600.00 for getting the truck to the dealer, is at the upper end of the mid-size SUV category. Were not sure this vehicle is really worth the price when there are many great SUVs available today for much less money. Company Name: Leopard Publishing Co.